Earlier this month, the Associated Press publicly revealed a letter drafted as part of an effort to get Julian Assange a Russian visa. WikiLeaks implied that the letter, taken from a larger cache of WikiLeaks documents, was not authentic and accused the Associated Press of using materials provided by former FBI informant Sigurdur Thordarson. Media reports and an affidavit signed by Assange assert that the hard drives that Sigurdur Thordarson passed to the FBI contained secret recordings (as does the AP’s cache), while a pair of documents from the WikiLeaks’ legal team show that the hard drives – and therefore the secret recordings – were Assange’s. In late June, 2014, Danish lawyers working with the organization were preparing to send complaints to the Danish authorities claiming that the FBI violated the law by buying hard drives stolen from Julian Assange. The Danish legal team drafted a pair of letters to be signed by Bjørn Dilou Jacobsen (though the metadata identifies Eddie Khawaja as the author), one for the Danish Police and one for the Danish Independent Police Complaints Authority. Emails sent among the WikiLeaks legal team say the goal of the complaints was to open investigations into Thordarson and “more importantly” into the FBI. These letters, drafted in Danish by Julian Assange’s lawyers, both state that the hard drives were stolen from Assange. 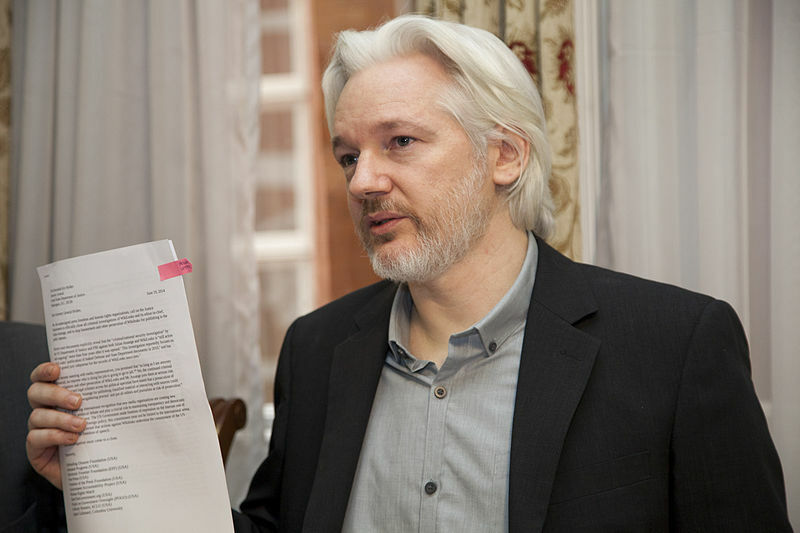 In contrast, Assange’s affidavit describes the drives as having been stolen from (unnamed) individuals associated with WikiLeaks and as containing chat logs, financial documents and “video footage taken in secret.” Though the contents of the complaints do not appear to have been previously revealed, WikiLeaks’ public statements confirm that complaints were filed. The affidavit’s description of the “video footage taken in secret” comes immediately after a highlighted passage in which Assange quotes a report that the FBI asked Thordarson “to wear a recording device.” Assange’s affidavit omits portions of the report which explain that Thordarson refused to wear a recording device. But he declined to wear a recording device… Thordarson felt that wearing a wire in an attempt to secretly implicate Assange in LulzSec’s illegal hacking activities was a step too far. 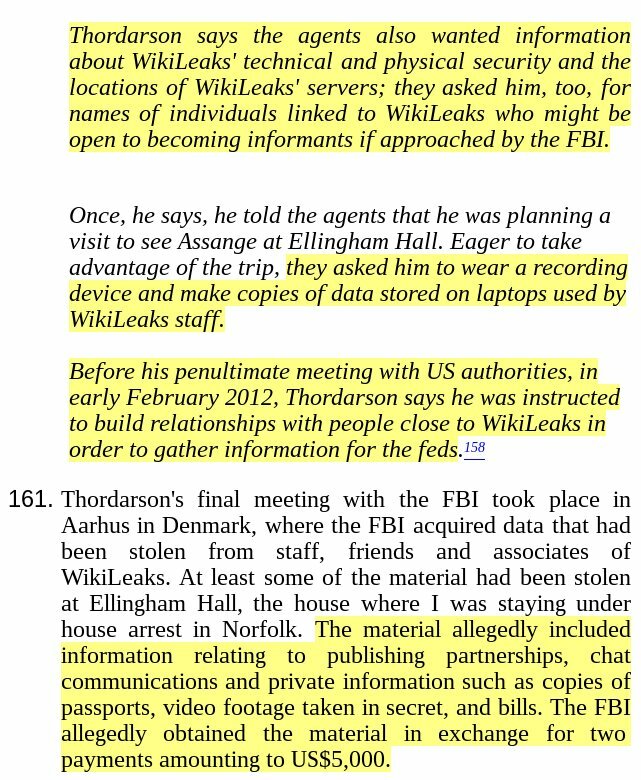 If the secret video recordings provided to the FBI were not made by Thordarson, they logically must have been on the hard drives that WikiLeaks’ lawyers say were stolen from Assange. Whether or not Assange was responsible for the creation of the secret recordings, he was not only aware of them, but kept copies of them. WikiLeaks’ tweets did not address the security problems posed by the FBI possessing that cache, or deny the existence of the Associated Press’ cache’. Instead, they appear to have been an attempt to poison the well through a combination of accusation, insinuation and non-denial denials. While WikiLeaks accused the Associated Press’ of “unconscionably” not declaring the source to be Thordarson (see below), WikiLeaks left out the fact that Thordarson’s source was Assange. This deserves to be fatal for WikiLeaks: it is mortally embarrassing for an organisation of its type to have this sort of leak. Chat logs etc shouldn’t even exist. No source should trust their security. Regardless of the identity of the source(s) behind the Associated Press’ story, the materials provided to the FBI were maintained by and taken from Julian Assange. If WikiLeaks’ simplistic accusation is correct, then Assange is the ultimate source for both the FBI and the Associated Press’ series of stories. Copies of the complaints are embedded below. They may also be downloaded via a Distributed Denial of Secrets torrent here. It is not the intention of this article to confirm, deny, or comment on the identity of a source or chain of custody for the cache referred to in the Associated Press’ story. References to WikiLeaks’ accusation an arguendo exploration of the logical conclusion of WikiLeaks’ accusation. Update: An error in the way the files were opened and converted into PDF resulted in a formatting error. The original version of the exported files have been replaced with ones with more accurate formatting.